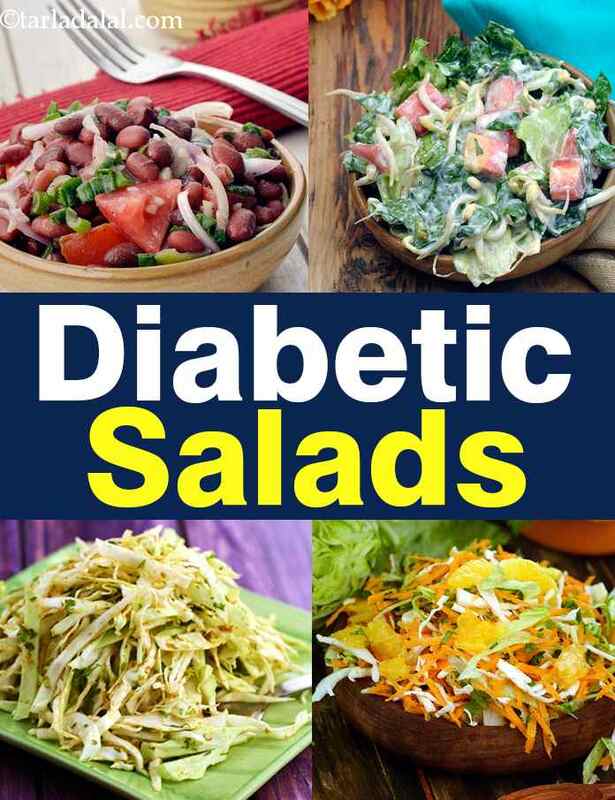 diabetic salad recipes. diabetic raita recipes. Salads and raitas are suggested as an essential part of a diabetic meal by most dieticians. If you have been having plain, run-of-the-mill ones and getting bored in the bargain, this section will be an eye-opener for you! Right from daily fare to innovative and exotic salads and raitas, these recipes offer a delicious way to reach your low-calorie goals without compromising on the nutrients. Made using low-calorie, diabetic-friendly, fibre-rich ingredients, some of these salads are so tasty and sumptuous, they can be had as snack or meal on their own! It's not that easy to figure out which salad is healthy. Try this jowar kale salad as a meal byitself as it has a mix of all super nutrients. Jowar is a whole grain packed with magnesium and calcium. Beans sprouts have lots of protein and go great in this low calories salad called beans sprouts and capsicum recipe. Sprouts and fruits combine well for mixed sprouts fruits and veggie salad. Rajma is a complex carb with a Glycemic Index of 29 which is low and is well used in Carrot cucumber rajma salad recipe and kidney bean salad recipe. Use cabbage (low carb, low in calories) in cabbage salad and cabbage carrot and lettuce salad. Make the popular middle eastern tabbouleh salad which has loads of parsely, tomatoes and onions. Use iron rich bany spinach to make baby spinach and apple salad in lemony curd dressing. Bulgar wheat in salads is perfectly used in Orange Tabbouleh and broken wheat and chick peas salad . Use low fat curds (without any sugar) in this mixed veggie raita. High fibre beetroots make a good beetroot, cucumber and tomato raita. Jamun is a blessing for diabetics due to the enzyme jamboline and used with low fat curds to make jamun raita. Enjoy our Diabetic salads, daibetic Indian salads and diabetic articles below.